Ask fellow campers about "Apache-Sitgreaves Nat'l Forest / Canyon Point Campground" and nearby attractions. Great NAT. park campground. Hot showers and loads of space between sites. No disappointments here. Hard to get electric sites. We camped at Apache-Sitgreaves Nat'l Forest / Canyon Point Campground in a Travel Trailer. The Best of Old Fashioned Camping - with electric! The hospitality people were amazingly friendly and yet non-intrusive. The campground was neat and clean. The outhouses - well, they were outhouses, odor and all. There are very nice flush toilets at the shower building. I do advise to camp across the road or a space or 2 away from outhouses. There are only 4 pull-through spaces which are really roomy. There are also several long back in spaces. All electric spaces are in Loop A. Go to www.recreation.gov to reserve space during the high season. October was nice weather and walk-in only. We got there Friday morning and were able to choose a pull-through space. Loop A filled up pretty good by Saturday morning. Perhaps being just 2.5 hours from the east Valley is the reason - it's close and easy. We specifically asked about this item: Contrary to a previous review, there is only 1 tag per vehicle. It goes in the tow vehicle or toad if you choose to leave the park. It does not stay with your trailer or tent. But this is true for all the National or State parks that I've been in. Also, being a National Forest, the stay limit is 14 days. As much as I almost hate to share it, it was a weekend in heaven. Relaxing, peaceful (with the sounds of children laughing in the background), quiet, dark & starry. Take the time to walk the .7 mile to see the Sinkhole area. You may even get lucky enough to see some of the many elk in the area. For those looking for the RV park feel with entertainment and stores within walking distance, this isn't it. There's a small local store a mile up the road in Forest Lakes and a great restaurant across the street, but that's about it for really close businesses. However, if it is a "camping" session that you seek, complete with fires in the fire pits at night, this place is tops in my book! You can buy firewood at the gate for $6 a bag and ice for $2. There is a dump station by the entrance as well as potable water if you need to fill up or re-fill during your stay. What more could you need? Take a good book and a comfy chair and plug in the coach for a truly rewarding weekend (or week if you can). We camped at Apache-Sitgreaves Nat'l Forest / Canyon Point Campground in a Fifth Wheel. This is a forest campground, not an RV Park, just wanted to make that clear from the start. Only 32 of the sites provide electric hookups, and none of them are 50 amps. About half of the spots in this campground can be reserved on-line. The rest are available only on a walk-up basis. I believe all of the spots in Loop A have electric hookups; Loop B has no electric hookups. 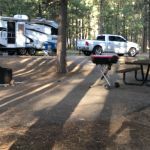 Canyon Point is the only forest campground in the Payson, AZ area that offers electrical hookups, so this campground is very appealing to many and difficult to get reservations on holidays and weekends. You have to make them way ahead of time. This is beautiful forest, seems to be frequented by very friendly, quiet, respectful campers (not the party crowd), far enough away from the highway (although you can still hear a loud truck now and again), nice shaded spots, and easy access to a general store a couple miles up the highway, 2 popular lakes within 5-10 miles distance - Willow Springs Lake and Woods Canyon Lake and absolutely breath-taking views of the Mogollon Rim along Forest Service Road (FSR) 300 also known as Rim Road. Pros: Beautiful, spacious camp sites in a relatively quiet campground. We saw some big rigs in this campground, although I don't know if they have size limits. I'm not too familiar with electricity requirements on bigger rigs, but I know they don't have 50 amp electric hookups at this campground. Campground is very close to many activities and scenery. General store within 2 miles in Forest Lakes. Showers and flushing toilets available at the front of the campground (although they're not very clean), along with ice and firewood. There is a free non-potable and fresh-water fill-up area along with an RV dump area at the front of the campground, so this is an awesome amenity for a forest service campground. We took our 6 gallon refill jugs to the refill station a few times to get free water for our pop-up trailer tanks. Cons: $25 per night seemed a little steep for an Arizona campground, with no water hookups, but I guess one man's steep pricing is another man's bargain; and if you consider the free water at the front of the campground, the $25 per night might not be so bad. Some of the staff seemed very unorganized and scatter-brained and one was incredibly rude. This rude woman was confused, and just wasn't doing her job right. I asked her what other sites were available and she jumped all over me about how we had reserved a specific site # and if we wanted another, we'd have to cancel and pay a penalty, blah, blah. Wow, that lady had some anger management issues! We were unfortunate to always have to deal with her instead of the other friendly, knowledgable staff. This woman didn't give us a ticket to hang from the mirror on our tow vehicle and this resulted in several staff members decending on our site in their ATV's like the FBI raiding a terrorist camp asking where our tag was. Then it happened again when we paid for an extra night and she forgot to give us a new tag with a new date. We came back from an excursion and were allowed to enter past the "guard gate" with no problem, but then sure enough the little "police-men" came riding up on their ATV's to see why we were still there if our tag had expired. We thought they were going to ask us to prove that we had paid. Amazing how one rude staff member that doesn't have their act together could make it so hard on everyone. So, word to the wise, make sure you get one of those tag thingy's to hang from your tow vehicle's mirror or you may be "burned at the stake!" The vault toilets throughout the campground were absolutely disgusting and smelled to high-heaven. If you reserve a spot, look closely at the map to be certain you don't get a spot anywhere near those toilets. We were lucky not to be downwind of one of those toilets. Yuck! It's hit or miss when you are making a reservation on Reserveamerica's website or via phone for this place because frankly some of the spots can't accommodate a larger trailer or RV. No one can help you select a good spot for your rig, so you are literally taking a chance, and hoping that you get a larger back-in or pull-through site for your RV. We stayed in Loop A, spot #29 and this was fine for our pop-up trailer, but would just be unacceptable for anything bigger. Spot #31 also seemed small. We saw several back-in spots that were bigger in Loop A: #27, #40, and #36 are all that I remember. The flush toilets and showers at the front of the facility were a little better, but not much. We camped at Apache-Sitgreaves Nat'l Forest / Canyon Point Campground in a Tent Trailer. Campsites are nicely spaced out, with lots of trees in the area and between sites. Showers are available, and are included at no extra charge. They are not coin-operated. Most toilets are pit toilets, with flush toilets available at the showers. The pit toilets located nearest my campsite were quite full, apparently because someone had dumped some garbage into the toilet. This is a very beautiful area, and I would definitely stay here again. We camped at Apache-Sitgreaves Nat'l Forest / Canyon Point Campground in a Travel Trailer. Are you affiliated with Apache-Sitgreaves Nat'l Forest / Canyon Point Campground ?